YOU CAN RENT VILLA DHYAN - UBUD SAYAN AS WHOLE OR PARTS OF IT! the whole VILLA for up to 6 people (plus may be a teenager or child). VILLA DHYAN- UBUD SAYAN was built by a famous German artist painter in Balinese style with traditional materials already 20 years ago. The character as a unique artists retreat with its traditional thatched roofs, woven bamboo walls and open living areas is thoughtfully maintained and gives you an authentic BALI experience. A total renovation in 2010 made it updated in its facilities (satellite TV, air-condition, telephone and wireless Internet). It sleeps up to 7 people who get serviced by 3 Balinese doing the cooking, cleaning, laundry and gardening. In Dec. 2011 was built a BUNGALOW with extra living room. The STUDIO HOUSE has also a bedroom, own bathroom great view. The villa is located on the famous ridge of the Ayung River between the FOUR SEASON and AMANDARI resort. The magnificent view from our place is one of the best in the whole area and gives the impression of living in paradise. Within 10 minutes you can get by car to the traditional country town of UBUD with its native market, countless art galleries (Tony Raka, Gaya and Agung Rai gallery as a recommendation), fine art museums (Puri Lukisan, ARMA Museum and Neka Museum), shops and numerous restaurants with excellent food. Ubud is having daily traditional dance performances, exciting cultural events (International Writers & Readers festival, Bali spirit festival) and temple festivals all around the year. Ubud is an hour from the DENPASAR International airport, the KUTA & LEGIAN beaches and tourist hub. To SANUR and the nearest beach, it’s about 40 minutes drive. The popular white water rafting starts very close by. We are providing mountain bikes and there are walking trails along the river. THE VILLA OR PART OF IT IS ALWAY RENTED WITH A CAR AND DRIVER (included in the price,10 hours a day, without gas)! Please read the comments of previous guests! I came from Germany to Bali to start living and working as a free lance artist after teaching arts in Germany for 15 years and in Jakarta at the academy of fine arts in 1982. I built a studio and house for living. in 1988. Over the years the palce became more and more comfortable adding a main house and a swimming pool. Originally it was not built to be rented out. Surrounded by unlimited views into kilometers of coconut trees, into the breathtaking gorge of the river to the paddies of the opposite side of the river and when its crear in the morning or late afternoon you can see two volcanos. And when its clear you even can see the 40 km distant Jimbaran ba with the ocean. Its a very peaceful inspiring environment. and its only 4 km from UBUD, where you find lost of restaurants, art galleries and cultural events. The Balinese staff of our house is excellent and works for more than 20 years with us. Every bedroom has its own bathroom either indoor or outdoor or combined in-and outdoor. The bathrooms provide hot and cold shower, toilette and two sinks in the master-bathroom and bungalow bathroom. There is extra toilettes in the master bedroom and studio bedroom as they are upstairs. The BUNGALOW bathroom is connected with the bathroom and toilette. The MAIN HOUSE and DINING PAVILION have traditional thatch roofs, the STUDIO HOUSE and the BUNGALOW have traditional shingle roofs. 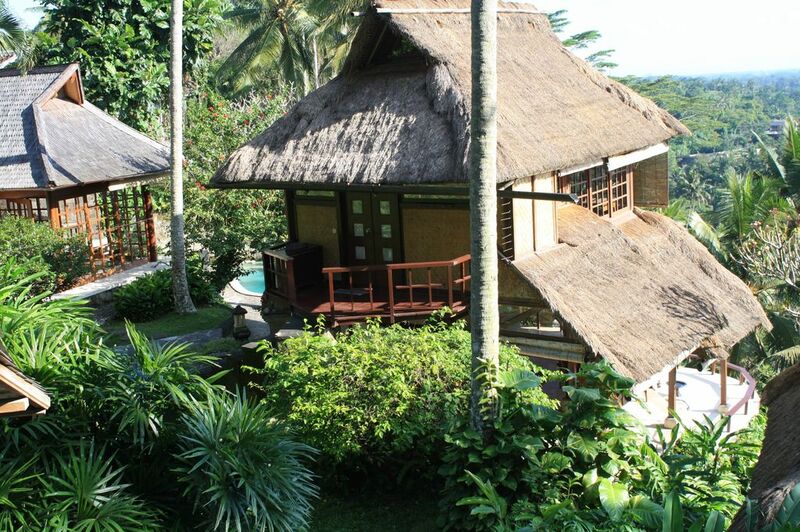 The houses are all in traditional Balinese style architecture but with western comfort. The staff of four (cook, service, gardener, pool service) provide up to three meals a day. The cook goes shopping after she got money and will provide the bills. YOU choose the meals from our menu or BALINESE cook book. We have TV (satellite dish for many programmes like CNN, BBC, MTV etc. ), DVD player Telephone, cordless internet (WIFI) with your notebook or TAB. The laundry (washing machine) is done by the service girl Wayan Weni and also the ironing. The whole place is unique, traditional Bali feelings combined with excellent service of cooking, laundry and driving. magnificent stay with great staff and food! The six of us were impressed with the great view of the location from all rooms of the villa. The accommodation was very beautifull, clean and specially tastful. A wonderful caring of the house staff and especially the food was incredible. The best views, fantastic room, incredible people! Leben im siebten Himmel ? Nicht ein Haus, sondern ein ganzes Ensemble (und damit sehr balinesisch) von stilistisch raffinierten, in die Landschaft ideal eingepassten Bungalows, Pavillons und Studios am obenren Hang des Ayung River. Auf mehreren Ebenen und immer mit einem atemberaubenden Blick ins Ayungtal, auf die tropische Baum- und Reisterrassenvielfalt, bis zum Jimbaran-Beach und bei guter Sicht bis auf den Gunung Batu Karu. Das Innen und Außen der Häuser – eine berauschende Symphonie fürs Auge ! Und die Lage? Nah zur mittlerweile tagsüber bedrängenden Ubud-Turbulenz, aber auch zu dessen nach wie vor attraktiven, vielfältigen kulturellen Angeboten. Und gleichzeitig ganz ausgesetzt der immer noch überwältigenden Natur Balis: Man tritt durch das Eingangstor aufs Gelände von Rumah Dhyan, und gelangt aus dem Trubel draußen unvermittelt an einem Ort der absoluten Ruhe und Kontemplation. So schön und so typisch Bali, dass überall und immer wieder der Blick hängen bleibt, mal auf einem Detail der Anlage, auf einem Punkt im weiten Talschwung und plötzlich angezogen von einem Lichtstrahl zwischen den Wolken über den Kokoswipfeln. Dazu wird ein Service geboten, der einer bedenklichen Verwöhnung nahe kommt: eine exzellente Küche, eine selbstverständliche Fahrbereitschaft und kompetente Ratschläge für den Fall, dass man sich ins Ubud-Gewimmel stürzen oder eine Inseltour machen möchte. Leben wie im siebten Himmel ? Nein: Wie ein (Lebens-)Künstler in Ubud ! ...vielen Danke fuer die wunderbare Beschreibung unserer VILLA DHYAN in Ubud. Ich bin sprachlos gegenueber einer so gekonnten und emotionalen Bewertung unseres Platzes, der Einmaligkeit des Ausblicks, der architektonischen Situation und unserer Kueche..
Hoffe Sie koennen sich ein andermal wieder bei uns einmieten. It's a pity that you comment was in German as many of our guests are English speaking. The way you described the location hits the point and your comment on the excellency of our staff including the driver makes them proud. Your comment of the food makes our cook very happy. That our place is still quite, original BALI STYLE and close to nature in comparison to the busy UBUD made an important point. Thanks you very much for your writing. Hope to see you again in UBUD-SAYAN! The village of SAYAN, famous for its artists since the 1930ties of 20th century is about 4 km outside of UBUD. UBUD is the CULTURAL CENTRE of BALi with many temple-festivals, dance performances cultural events like UDUD WRITERS &READERS FESTIVAL, BALI SPRIT FESTIVAL and others. Art MUSEUMS like the ARMA, NEKA, PURI LUKISAN and many ART GALLERIES also of high international standard like the TONY RAKA FINE ARTS in Ubud-Mas. Numerous restaurants and shopping at the market are other highlights. The surrounding is offering excursions to vulcanos (Mount Batur an active Vulcano 1 hour by car and to climb 2 - 3 hours! ), white water rafting at the Ayung River,Bird Park, Reptile Park Elefant Park, mountain biking and hiking. A WATERPARK called WATERBOOM is very attaactive for children and adult. About 40 minutes to go for the nearest beach at SANUR and Waterpark (WATER-BOOM)! By TAXI you go in one hour to the airport, depending on the time of the day. Der Basispreis it fuer 2 Personen berechnet. Bei einer Buchung ueber 10 Tage gegen wir 10% Discount. Der Preis fuer fuer einen Monat beträgt 2600.- Euro Das Ensemble der Villa besteht aus 1. einem Haupt Haus mit Queen Bed mit eigenem Bad und Zusatztoilette im Schlafraum und einem offenen Wohnzimmer; 2. einem Bungalow mit 1 Queenbed mit eigenem Bad und einem 'indoor Wohnzimmer"; 3. einem Studio-Haus mit wahlweise Twin- oder Queenbed mit eigenem Bad und Zusatztoilette im Schlafraum Es steht die ganze Villa nach Bedarf zur Auswahl. 4. einem Küchenhaus 5. einem Esst Pavillon 6. Einem Service Haueschen fuer Waschmaschine etc.